Between Chamonix and the Val d’Arly, a short drive from Geneva airport and easily accessed by road from Albertville. A modest-sounding 1113m altitude means it’s not snow-sure, but having Mont-Blanc nearby can attract frequent snowfalls. Megève remains relatively undiscovered by skiers from the UK, with the notable exception of those who value a traditional, upmarket ski experience coupled with a peerless range of premium services. Part of the Evasion Mont-Blanc ski area with surprisingly varied terrain. You can extend the possibilities with the Mont-Blanc Unlimited skipass. 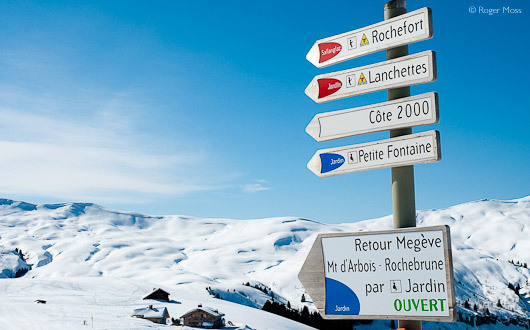 Megève’s ski terrain blends almost seamlessly with that of its neighbours St-Gervais, Combloux and Saint-Nicolas de Véroce, and rather less so with Les Contamines-Montjoie, which is accessible only by road. 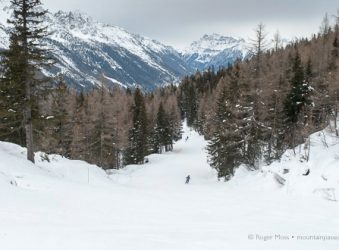 The Domaine Evasion Mont-Blanc combined lift pass allows you to ski it all, and in the process discover the surprisingly varied terrain and scenery on offer across the valley in the Combloux sector. We can’t imagine coming here and passing up that particular opportunity. Megève’s own terrain comprises l’Alpette (1871m), Côte 2000 (2014m) and Mont d’Arbois (1840m), with not too many drag-lifts to slow things down. 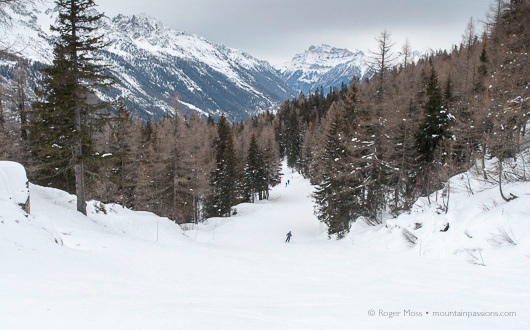 Pistes are often wide and tend to be conservatively-graded, something which will appeal to more timid skiers. That said, you’ll also find a few stamina-testing reds and blacks, and grooming throughout is to a predictably high standard. New for 2017/18 winter season was the upgraded Chamois gondola in the village centre with new cabins and improved flow. Often overlooked by those dazzled by the lure of nearby Chamonix, Les Houches is a significant ski area in its own right, with tree-lined pistes and friendly atmosphere. Upmarket Alpine town with charming pedestrianised centre. Expect luxury hotels and chalets and renowned restaurants both in the town and on-mountain. After tiring of St Moritz the Rothschilds turned their attention to Megève, opened a luxury hotel and in so doing propelled the town to international renown. It has since lost little if any of its charisma, still hosts the Megève Polo Masters (played on snow) and its star-studded boutiques speak for themselves. And you thought Chamonix was glamorous. But it’s not quite all bling-and-furs; Megève’s passion for winter sports is a shared one, and any recreational skier will feel perfectly at home on the slopes. Window-shopping is free, and all the more enjoyable to the tinkle of sleighbells and hoofbeats. Accommodation-wise, don't expect too many budget options – there’s real luxury available here, both in hotels like Le Mont-Blanc and Le Lodge Park, not to mention the classic chalet style of Les Fermes de Marie. 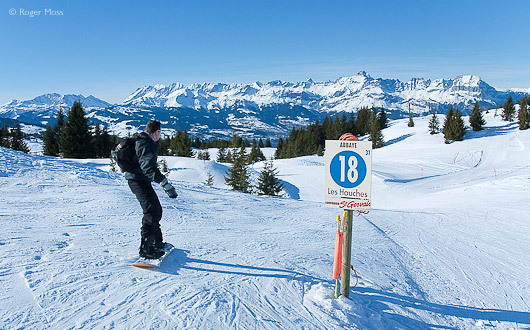 Why go skiing in Megève ? 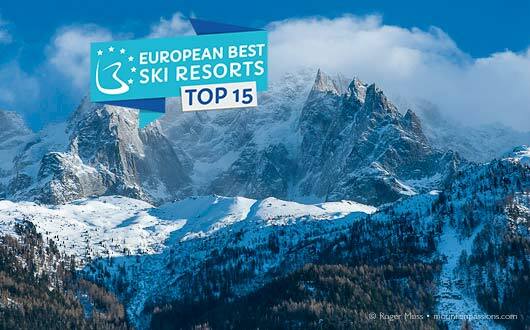 Look beyond the exclusive image and you’ll find a strong contender for intermediate leisure skiers. A commitment to families has also brought Megève the Famille Plus Montagne label. Those with a hankering for mileage will find that the Evasion Mont-Blanc lift pass offers good value, particularly in view of the quality on offer. Which brings us to value. Skiers on a tight budget will probably look elsewhere for accommodation, and drive or bus in to enjoy the skiing. On the other hand, those with the means to enjoy the very best that Megève can offer will find levels of luxury which will more than satisfy the most demanding clientèle – or anyone in search of somewhere extra-special for a grand occasion or a romantic break. Plenty of choice for boarders with long cruises and fun zones. Trails throughout the Evasion Mont Blanc area. Reserved parking available throughout the resort. Good range of adapted and accessible accommodation and restaurants. Summit Ski School offer private lessons and will pilot disabled passengers on a Tandem Ski. Ski Assis Evasion has good range of equipment and also offers group instruction with transport. English spoken. Surprisingly extensive linked-domain ski area. Terrain for most tastes, particularly more relaxed skiers. Ski area included in the Mont-Blanc Unlimited ski pass - 998km of pistes in 3 countries. Luxury accommodation for even the most discerning. Impressive commitment to sustainable development and environmental management. Non-skiers will find plenty to do. New daily transfers to Geneva and Lyon airports with ouibus.com, perfect for short breaks. Not surprisingly, there’s little budget-sector accommodation. On-mountain dining is expensive. Cheaper snack bars do exist for the budget conscious. Payable parking near village ski-lifts will add to your stay costs. It can take time to find your way around the ski area efficiently. Take the bus to access Mt d'Arbois and Côte 2000 sectors. If you need help, look out for the volunteer Ambassadors. Present at strategic points throughout the ski area and villages, they can help you find your way, inform skiers about snow quality or tell you what's on. Spread among four chalets, this well-conceived complex houses 63 apartments and suites, all with compact kitchenette and balcony or terrace. Underground parking is available. There’s an outdoor heated pool and Scandinavian spa, plus on-site bar and restaurant (booking recommended) serving a varied menu. The fixed price three-course menus are particularly good value starting at around 15€ excluding drinks. Breakfast offers a delicious and plentiful buffet but pricey at 25€ per person. and would recommend booking instead a ‘Higher Standard’ or ‘Junior Suite’. The hotel complex, lying in a 2 ha park at the heart of Megève, evokes a centuries-old small hamlet of high mountain pasture farms. Each of the original farm chalets was carefully dismantled and painstakingly reassembled. The results retain their traditional features, to which have been added all the home comforts of modern living. Nine chalets are discretely interlinked to form a luxurious and peaceful haven. The quality and services on offer are impeccable and the 71 highly individual bedrooms and suites have a charming simplicity and subtle refinement. The bar and lounge areas are warm, cosy and comfortable, with space for calm relaxation or shared afternoon tea and aperitifs. At the heart of the hotel is a magnificent traditional restaurant, and the second Alpine restaurant offers more relaxed dining in contemporary style. The spa was the first of the Pure Altitude Spas and provides 17 treatments cabins, swimming pool and Jacuzzis. In the heart of Megève, this legendary hotel has a unique atmosphere with it’s comfortable lounges, library, and the Enfants Terribles restaurant with its magnificent fresco by the poet Jean Cocteau. The bedrooms have a distinguished and harmonious style with Austrian, English and Savoyard influences and are largely furnished with beautiful antiques. The tea-room is famous for its 11 kinds of home-made hot chocolate but at 6-00pm it turns into ‘Le Georges’ champagne bar. The Spa Pure Altitude has 4 treatment rooms, sauna, Jacuzzi, fitness room and pool. 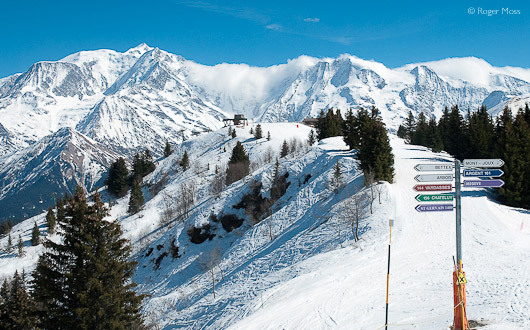 Mégève is an excellent base for non-skiers or those who love to mix and match their activities. There are signed walks and snowshoe itineraries which take you between forest and the breathtaking views of Mont Blanc. Le Palais sports and aquatic centre is just a short walk from the town centre. There's an ice-rink, pool, wellbeing centre and a climbing wall which should keep everyone entertained after a day on the ski slopes. There's also opportunities to learn a new skill on various workshops such as painting and drawing or cookery lessons with the chef at the famous Les Fermes de Marie. 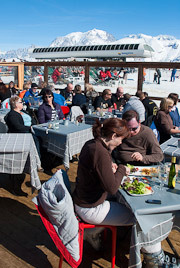 If you love your aprés-ski then Mégève offers plenty of choice. We loved Le Georges at the Hotel Mont Blanc where you can enjoy a late-afternoon hot chocolate in the cosy lounge or a glass of champagne at the bar from 6pm. Situated at the arrival of the Rochebrune cable car and Caboche gondola. This mountain restaurant was first constructed in 1954. The new ecological building recycles rainwater to flush the toilets, has solar panels for hot water and wood fibre insulation. The vast terrace enjoys panoramic views and if you stop for lunch you can choose from the menu or the barbecue (weather permitting). The food is lovely but comes at a price (expect to pay 15€-29€ for a main course). During our visit the service was not exactly attentive, but the setting is undeniably great. From Geneva, follow the A40 Autoroute Blanche to Sallanches. Exit and follow the N212 direction Megève (12km). From Albertville follow the D129 to Ugine then take the N212 to Megève. The nearest airport is Geneva (1 hour) which can be accessed by bus or taxi. Chambéry Savoie Mont Blanc is about 1hour 15mins. 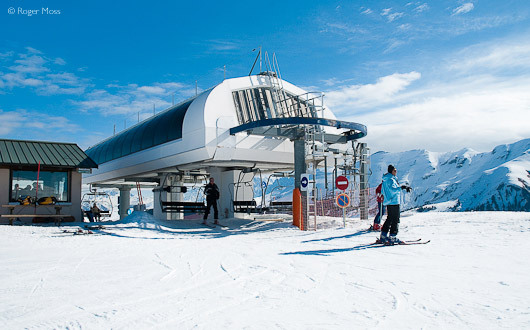 For bus connections see SAT MONT BLANC which provides links between Geneva, Sallanches and Megève. Or BORINI AUTOCARS do bus links between Geneva and Megeve. Jet2.com offers low cost flights to the French Alps from 7 UK airports. This couldn’t be easier - travel by TGV direct from Paris to Sallanches then take a bus or taxi (13km). Exactly how we’ve managed to ski all around Megève over the years without actually discovering what its own terrain holds in store until now is beyond us; perhaps we’ve simply been influenced by its relatively low altitude – and low profile on the average skier’s radar. Among those who prize premium quality services above all else, however, it has an enviable reputation founded upon an illustrious history. The summit of Alpette (1871m) offers pleny of possibilities. Our first morning finds us boarding the celebrated Rochebrune cable-car, the first in France designed for the exclusive use by skiers, having opened way back in 1933. The weather in the valley is mild, but after a surprisingly smooth haul to 1754m we’re relieved to feel firm snow conditions beneath our skis, despite an unnervingly lengthy spell since the most recent snowfalls. It’s clear that the piste groomers have done a skilled job, but as we launch off to join the Alpette chairlift we can sense that springtime can’t be far away. The six-seater lift speeds us smoothly up to 1871m, where we pause to take in the stirring sight of nearby Mont-Blanc before dropping down via the red-graded Scion piste to the 4-seater Petite Fontaine chairlift. The onward climb gives us an overview of the progress we’re making along a ridge which will eventually take us into the Côte 2000 sector. 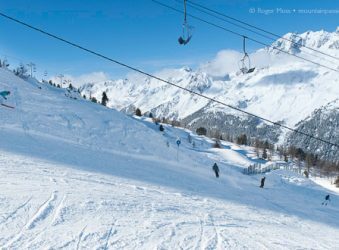 Getting there entails a short but steep tow, courtesy of the Roche Fort draglift, with the option of a longer one up its big brother Lanchettes, should you be tempted by the red-graded piste after which it takes its name. We opt instead for a more relaxed blue cruise on Géant over to the Côte 2000 chairlift. This actually tops off at 2014m and serves the red-graded Chamois plus a black – the innocent-sounding Marmotte. This time we take the steep option, which turns out to be more red than black, and tells us something about the piste-grading: ever the diplomat, Megève knows precisely how to flatter less competitive/technical skiers. The snow in this sector is among the best on offer, so we take advantage of it with a couple more runs before working our way back to Rochebrune for lunch. 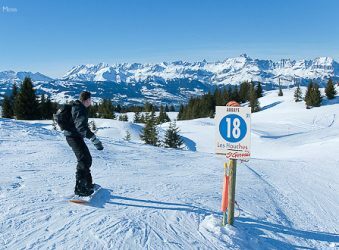 Megève – the place to ski and be seen? Megève’s enviable reputation exerts a powereful allure to those unaccustomed to compromises in their choice of accommodation and services. Being seen here will do your social standing no harm, particularly during the annual January Polo Masters events, which remain as popular as ever. When it comes to skiing, inevitable comparisons with Courchevel reveal marked differences, and not merely the 750m in altitude. 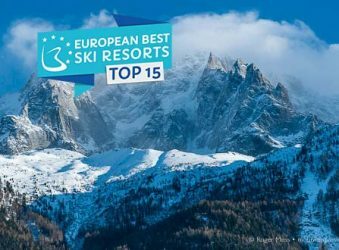 Things are altogether more relaxed and less pressured here, with no obvious sense of exclusivity on the slopes – which is exactly what many ordinary leisure skiers are looking for. 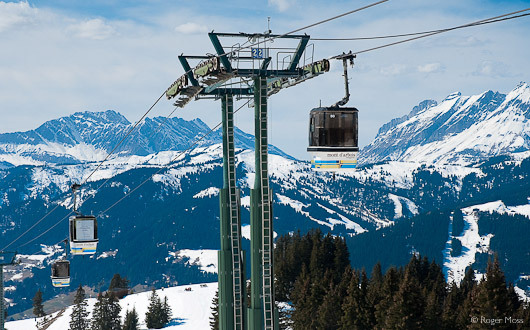 The Mont d’Arbois gondola offers spectacular views of the mountain scenery. Late afternoon cloud-banks advance from Mont-Blanc, seen from Mont d’Arbois. The afternoon finds us taking the Rocharbois cable-car across the valley to the Mont d’Arbois gondola, which also operates in summer for walkers and a steadily-growing number of mountain-bikers. The lift replaced a cable-car opened in 1934 and the almost 2.5km ride remains impressive for the sweeping views it offers of the Val d’Arly falling away far below. The views from the top are even better, and for a few minutes we simply gaze in awe at the sight of Mont-Blanc looming before us. It’s clear, however, that even at 1840m the late-season sun is now affecting the snow quality, so we make our way via the Mont Joux four-seater chairlift to 1958m, above the Saint-Nicolas de Véroce and Mont-Joly sectors. There’s no substitute for altitude, and the 2353m summit of the Mont Joly chairlift is an obvious target for anyone faced with milder spring-skiing conditions. It’s a long, slow ride but the fantastic views are matched by the descents which it accesses – the black-graded Chamois or the Chevreuil red. Time being tight, we have time for only one, so we opt for the red, which feeds nicely onto successive drops all the way back down to the base of the Mont d’Arbois gondola, right where we started. As we descend ever lower the going becomes correspondingly heavier, but the fast-sinking sun is accompanied by a welcome drop in temperatures. 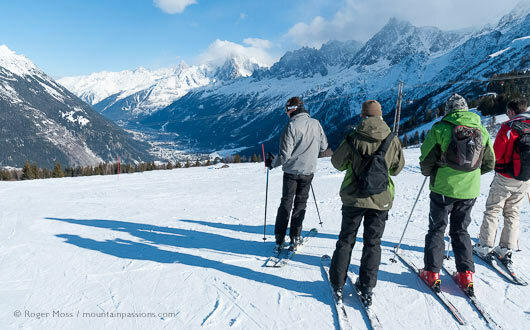 Elated by our day’s explorations, we resolve to start the next one over in Saint-Gervais, to discover what the Evasion Mont-Blanc ski area holds in store. Overall impressions, then? 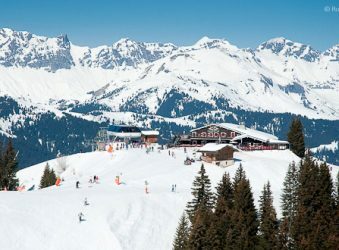 Well, we’d have to say that if you’re serious about your skiing then the lack of altitude makes Megève a destination which is less than snow-sure. No surprises there. Come here after fresh falls, however, and it’s a charmer. 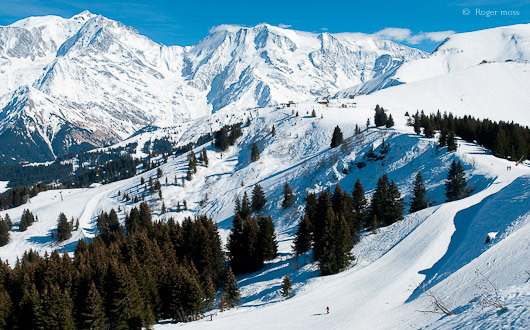 But spend some time skiing in the other Evasion Mont-Blanc resorts, too.